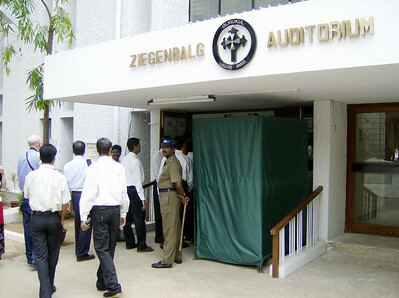 Gurukul Lutheran Theological College and Research Institute hosted The Tranquebar Tercentenary Celebrations in its Ziegenbalg Auditorium in Chennai, India. The National Council of Churches in India, Tamil Evangelical Lutheran Church and United Evangelical Lutheran Church in India also sponsored the events July 3-9 in Chennai and Tranquebar. 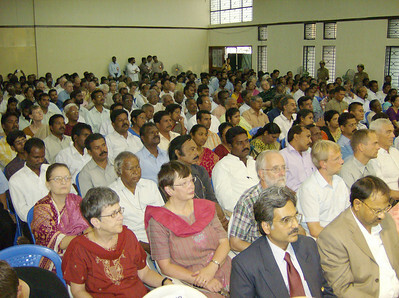 International guests and Lutheran church leaders joined hundreds in Ziegenbalg Auditorium, Gurukul Lutheran Theological College and Research Institute, Chennai, India, celebrating July 3-7 the 300th anniversary of the arrival of German missionaries Bartholomaeus Ziegenbalg and Heinrich Pluetschau in Tranquebar on the southeast coast of India on July 9, 1706. The Rev. 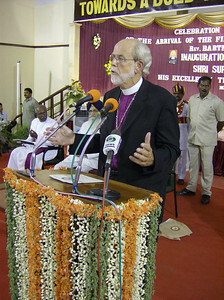 Mark S. Hanson, ELCA presiding bishop and LWF president, brought greetings July 3 to the inauguration program of The Tranquebar Tercentenary Celebrations. 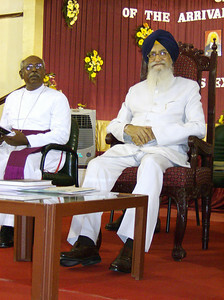 His Excellency Thiru Surjit Singh Barnala (right), governor of India's Tamil Nadu, sat beside Bishop Gideon Devanesan Rajagembeeram J., The Arcot Lutheran Church, July 3 before giving the inaugural address of The Tranquebar Tercentenary Celebrations. 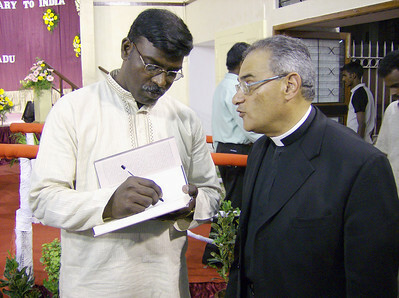 Dr. Daniel Jeyaraj (left) signs a copy of his book, "Bartholomaeus Ziegenbalg: The Father of Modern Protestant Mission - An Indian Assessment," for the Rev. Rafael Malpica-Padilla, executive director, ELCA Global Mission. 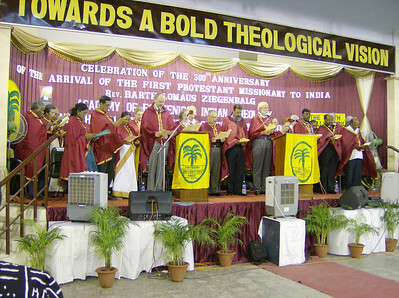 The Academy of Ecumenical Indian Christian Theology and Church Administration held a special convocation July 7 in honor of those who contributed to the cause for which Ziegenbalg arrived in India, awarding 26 honorary doctorates in divinity. 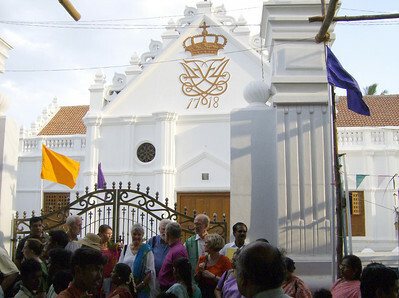 Weekend events showcased many buildings restored after the December 2004 tsunami, including New Jerusalem Church, which Ziegenbalg first dedicated in 1718 and was rededicated July 8. Ziegenbalg died in 1719 at the age of 37, and his body was buried in the church. 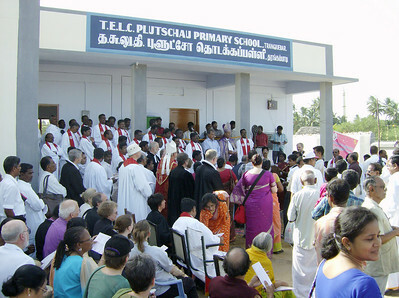 The Tamil Evangelical Lutheran Church preceded Sunday worship July 9 with the dedication of a new education compound, including the Plutschau Primary School. The Rev. 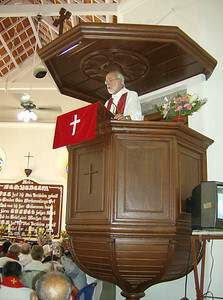 Gary M. Wollersheim, bishop, ELCA Northern Illinois Synod, read the Gospel lesson during worship July 9 in New Jerusalem Church, Tranquebar Mission, India. The Rev. 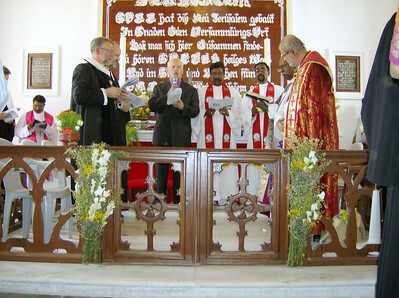 Mark S. Hanson, ELCA presiding bishop and LWF president, preached during worship July 9 in New Jerusalem Church, Tranquebar Mission, India.